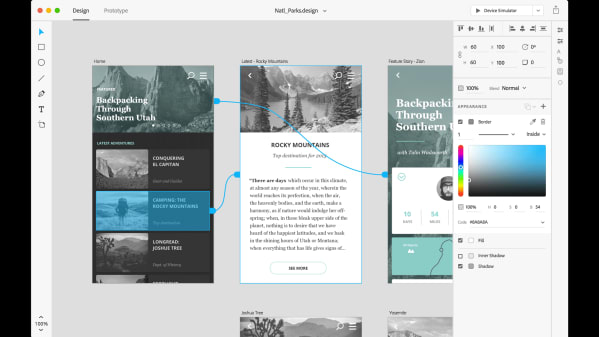 Adobe Experience Design CC (XD) is an all-in-one digital platform that provides the basic tools to both prototype and perfect UX projects. Rather than build this toolset on top of existing Adobe software, the company established an entirely new product development process, and thousands of independent designers were looped in to test early builds and provide feedback on pre-release programs—a uniquely nimble and transparent approach from an industry behemoth. The ever-evolving XD experience currently encompasses wire-framing, visual design, interaction design, prototyping, previewing, and sharing, and with the help of the creative community will become an even more robust destination for realizing websites and apps.